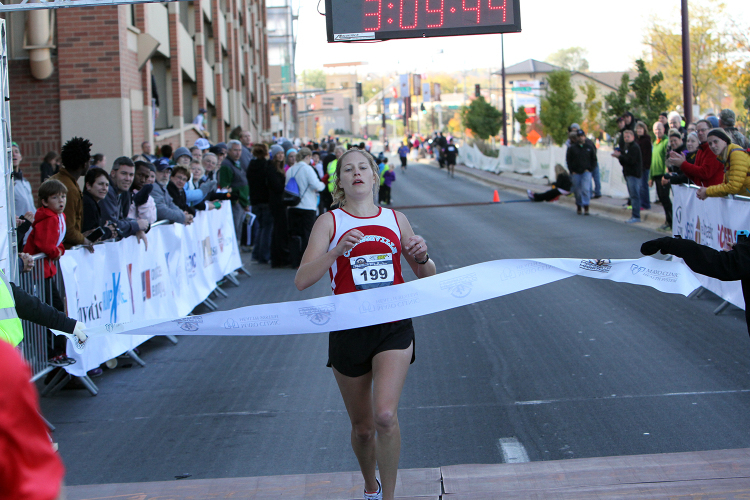 Laura Edlund '08 crosses the finish line to win the women's division of the Mankato Marathon held Sunday, Oct. 19. Photo courtesy of Sport PiX. St. Peter, Minn. – Former Gustavus Adolphus cross country, nordic skiing, and track & field Athlete Laura Edlund ’08 was the top female finisher at the Fifth Annual Mankato Marathon held Sunday, Oct. 19. Edlund, an All-Conference performer in cross country and a Capital One Academic All-American, crossed the finish line in 3:09.37. Of the near 500 competitors that took part in last weekend’s race, Edlund’s time ranked 10th overall. To go along with her All-Conference accolade in cross country in 2007, Edlund earned All-Conference distinction for a runner-up finish in the 5,000-meter run at the 2008 MIAC Outdoor Track and Field Championships. She was also Gustavus’s first Capital One Academic All-American in nordic skiing after finishing 18th in the 15k classic race at the NCAA Championships – the best performance ever by a Gustie at nationals. Edlund now lives in Minnesota City and is a social studies teacher in the St. Charles School District. She also serves as the head coach for the St. Charles cross country team and is an assistant coach for the track & field team.